Have to say again that we are loving the Oregon coast! This was our view from our site at Harris Beach State Park in Brookings. Although this was perhaps the best site in the campground(first come for open sites), the rest of the campground sites were quite nice with an easy walk to ocean views. $21 per night through April was still a bargain. This was the view across the street, looking towards Brookings. 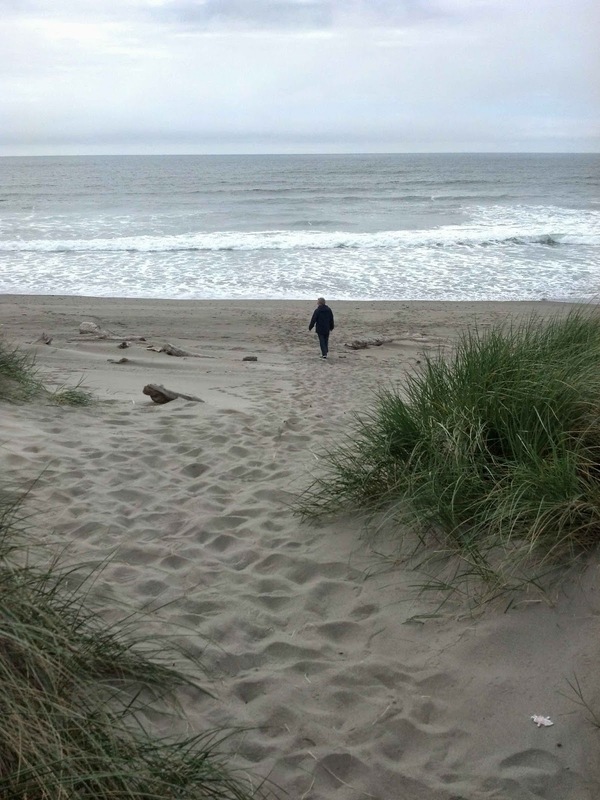 Oregon decided years ago in the early 1900's and then reaffirmed by state law in 1967 that all Oregon ocean beaches are accessible to everyone from the waterline to the high tide line. Not only that but the access areas, such as here, are free. Here there is plenty of parking, a nice family beach, and a clean , modern bathroom facility---all free. They call it the Peoples Coast. We had the good fortune to meet Mike, who owns a 2000 24 foot Lazy Daze Twin King. He and his wife are from the Grants Pass region, not far from Crater Lake. 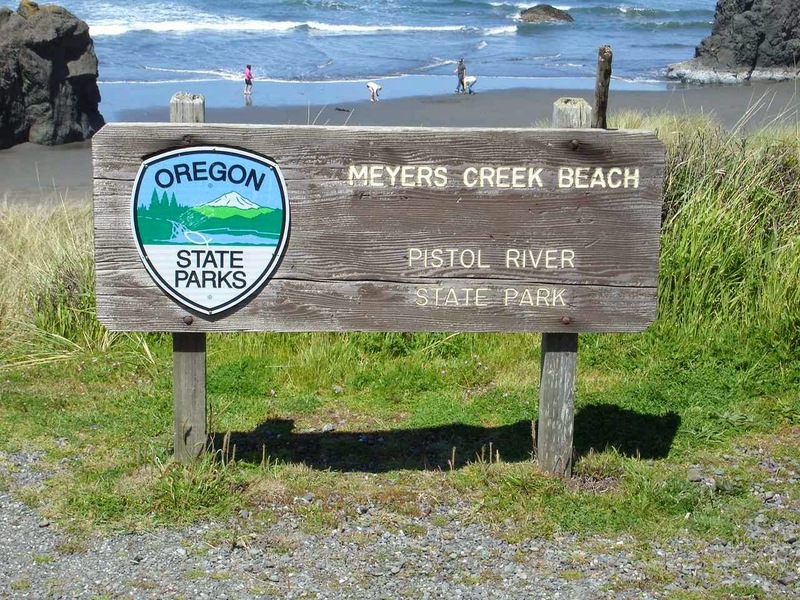 Like other Oregonians, he was quite proud of Oregon in general and Oregon state parks in particular. He and Ed (from Ed and Carol blog) gave good suggestions for stops going north. This would be a good time to suggest to you that you might find it quite interesting to look at Ed and Carol's blog archives. They travelled to some beautiful spots over the years and quite often would find a beautiful ,out of the way BLM land spot or dry camping area all to themeselves. Their travels range from California to New England and their home base used to be the east coast of Florida. This rock above is called Bird Rock--a nesting spot for many coastal birds--and is the largest island off the coast of Oregon. 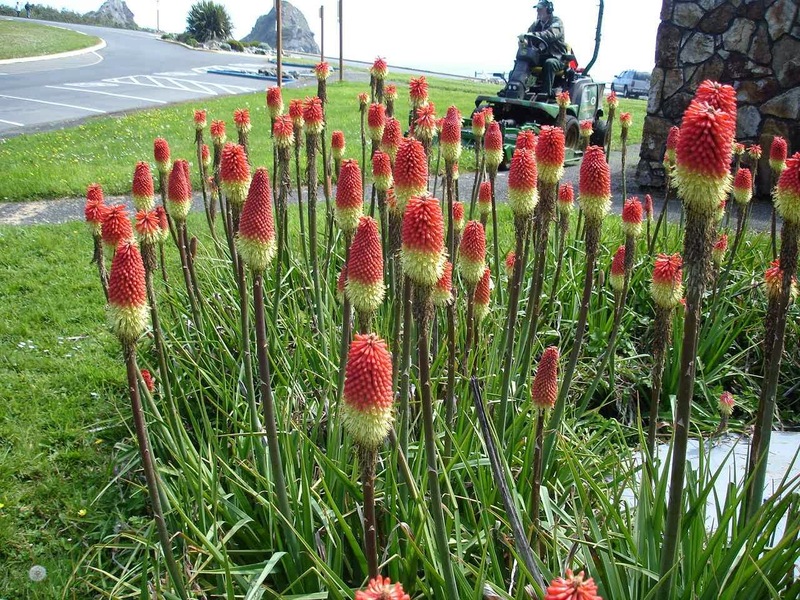 These flowers at the Day Use Area are new to us, so feel free to let us know if you know their name. They remind me of popsicles. 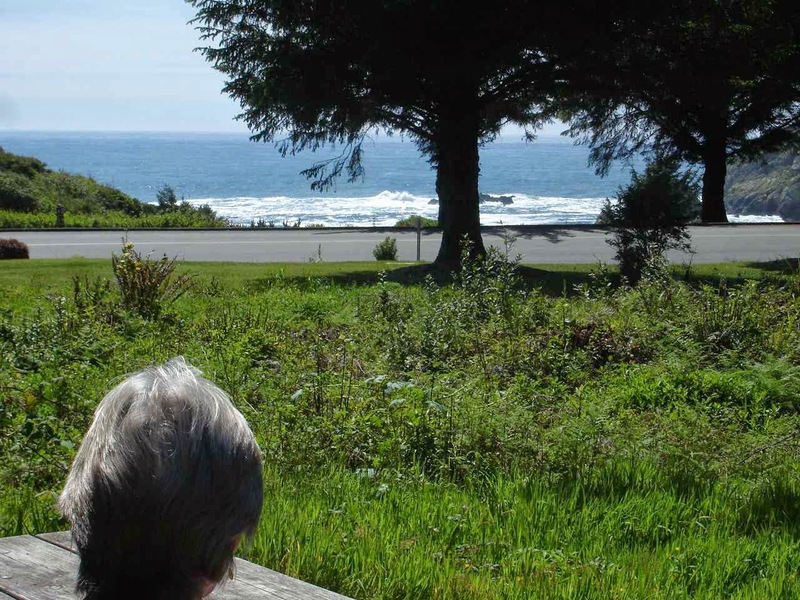 All along Route 101 are pull outs for views and for accessing the beach. This one was a larger one with plenty of parking. There was a large school bus there and the occupants were down on the beach. This panoramic shot of Myers Creek Beach gives you an idea of the beach and the coast heading north. Highway 101 is visible past the two rocks on the right. Of course, we had to look for a coastal spot to try some oysters and such. 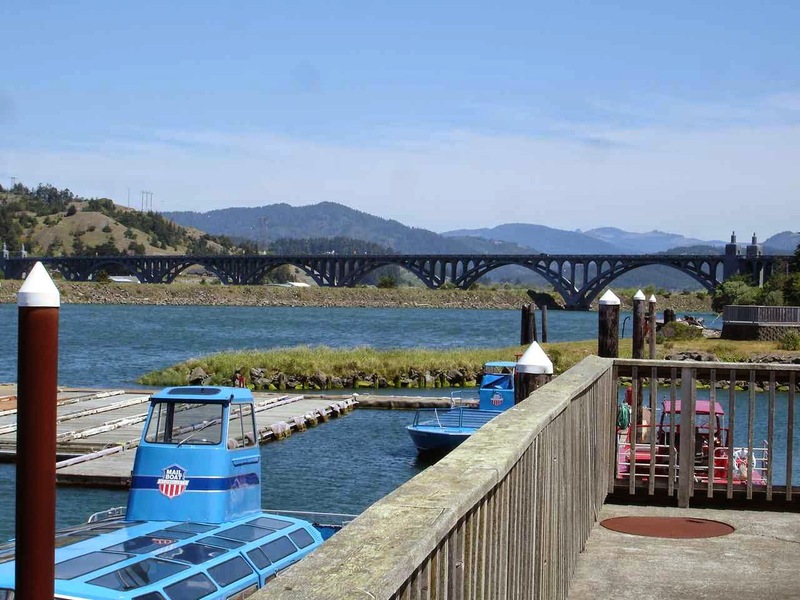 The town of Gold Beach is located where the Rogue River meets the ocean. The Patterson Bridge crosses the Rogue River while the ocean is to our left. The design might give you a hint that the bridge was completed in 1932. The Rogue River begins not too far west of Crater Lake, and then travels here to the ocean. The fast boats you see will take you on trips up to 104 miles up the Rogue River and back with stops for lunch or dinner.We had lunch here at the Port Hole Cafe. The oysters were clean, tasty, and gigantic by our experience. We are told they differ in size depending on where they are from. Very good stop! Also saw activity here at the charter fishing building. Lots of fish cleaning. A gentleman who was placing his full cooler in his SUV, indicated that the fishing was good--naming a bunch of different fish they had caught. Not familiar to me. It seems they have a choice of fresh water fishing in the Rogue or salt water fishing in the ocean. 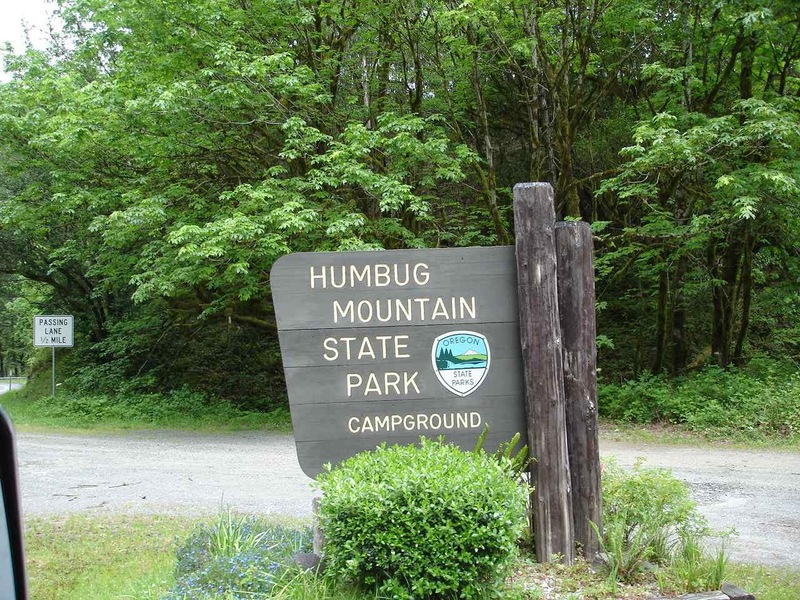 You would think that we are away from the coast, but no, Humbug Mountain State Park is right at the ocean beside the mountain(small mountain). 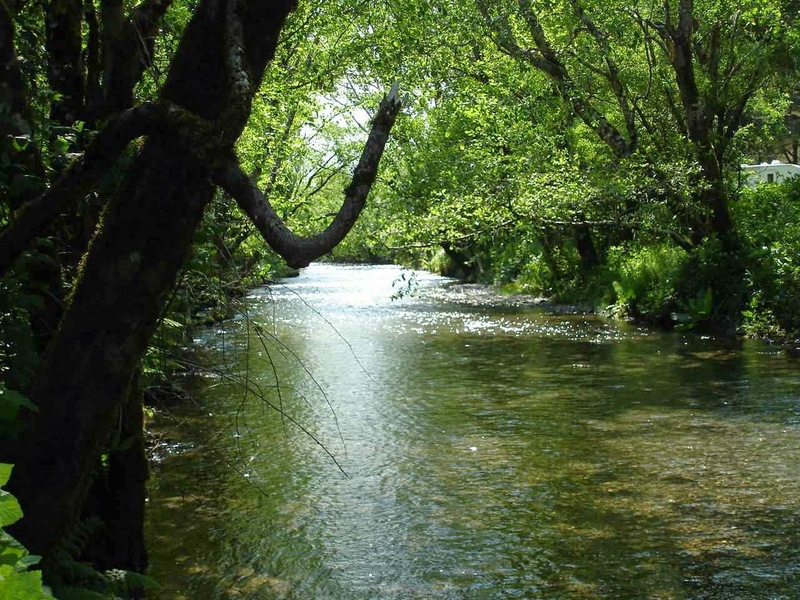 There is also a small stream that follows the highway here. A few trails in the park. 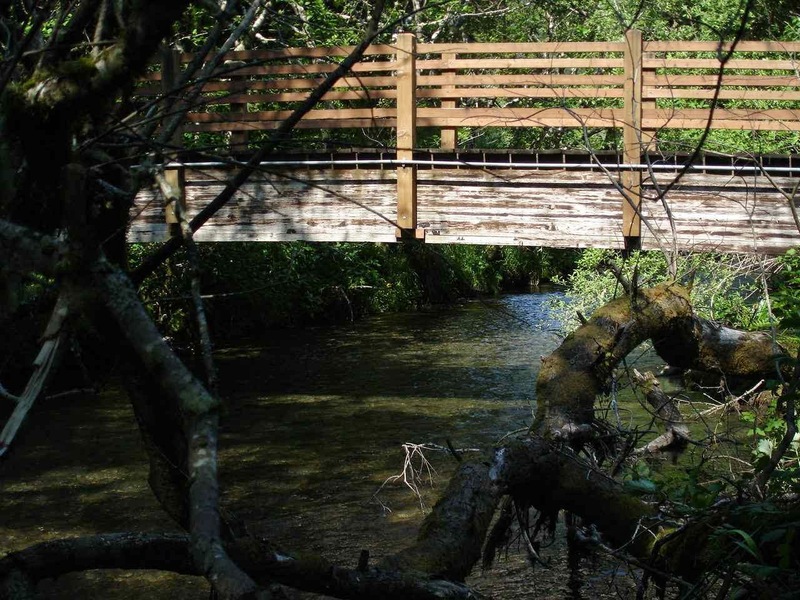 This bridge takes you over the stream to the mountain trail. Not a very tall mountain, so the trail is fairly short, but steep. It was a short hike under the 101 bridge to a very quiet beach. The beach here as well as at Harris Beach reminded us of Maine beaches with its dark sand. 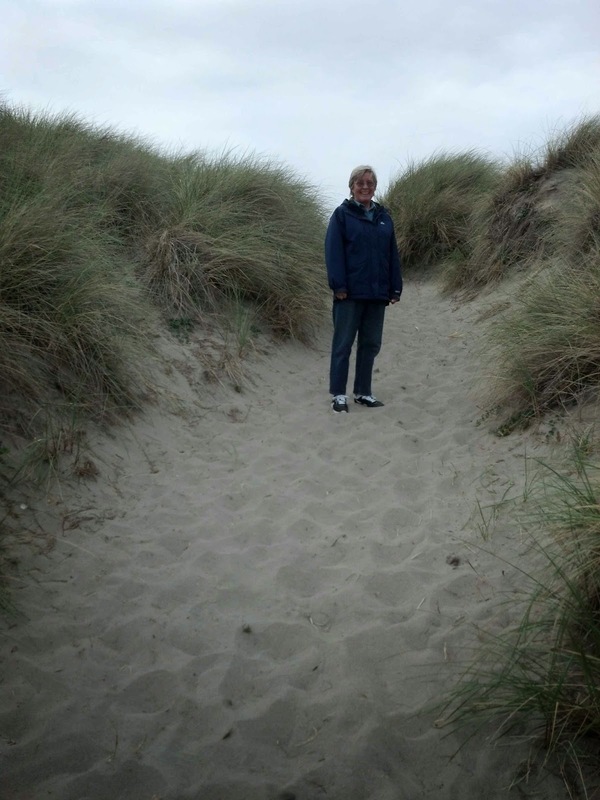 Its a short trip further up the coast to Bullards Beach State Park in Bandon, Oregon. This is a large park where all the sites have electric and water. There are also some sites with full hookups and a few of what they call Hike and Bike sites for hikers and bicycle campers. While the summer rate of $26 per night for water and electric is not cheap, it is better than the coastal California state park prices which can go up to $50 per night or more. We also came by at least one section of BLM land. 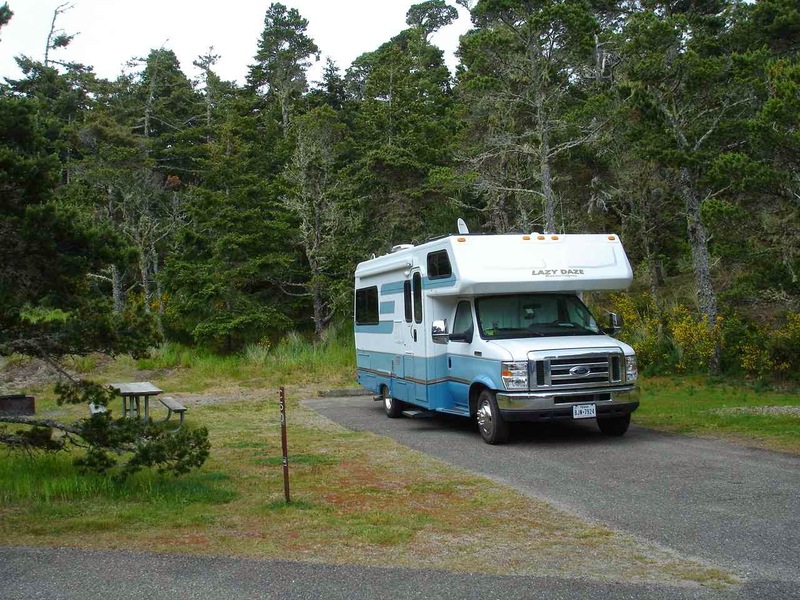 Our literature indicated that it was not yet open for camping, but there would also be National Forest camping away from the ocean, except for a coastal NF south of Waldport that Ed has pointed out for one of our future stops. Once again there is free boat launch and beach access for everyone here at Bullards Beach. From our site, it is a nice 1.2 mile walk to the beach. With plenty of parking, we could also drive to the beach as well as the 3 miles to the lighthouse. 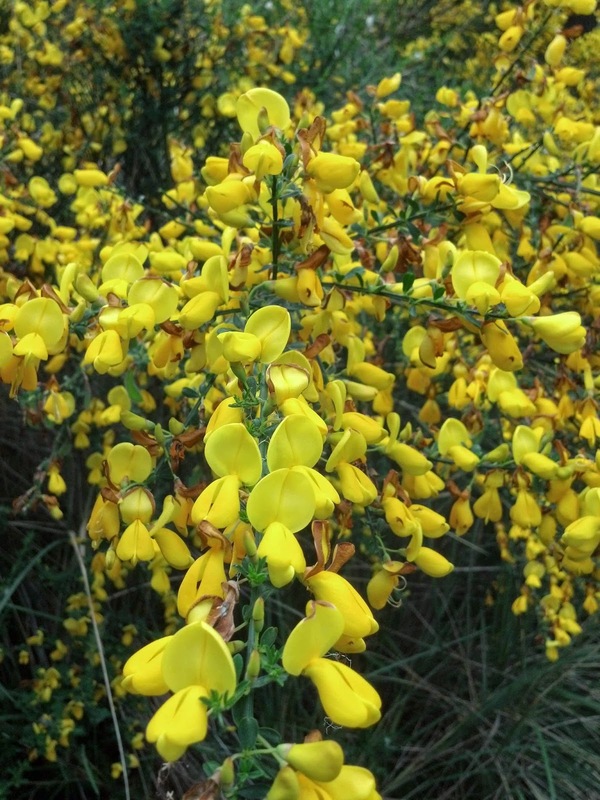 Nice bushes covered with these yellow blossoms. If you know what these might be, also feel free to send us a note. No, it's not Truro, Massachusetts on Cape Cod. This is the dune access to Bullards Beach with the light colored sand and dunes that are very similar to Cape Cod beaches. There can be some good sized surf here, but the swimming looks good. The difference from Cape Cod is that when you look away from the ocean here you see mountains and tall pine trees away from the shore. Looking forward to more of the Oregon coast. The problem is to decide on how much time we can take.